LCC library recent staged Decolonising the Arts Curriculum exhibition, in collaboration with the creators of Decolonising the Arts Curriculum: Perspectives on Higher Education zine. The exhibition launches a series of events across UAL libraries in 2018-19. 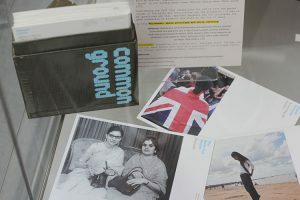 The exhibition was co-curated by UAL Associate Lecturer Rahul Patel, LCC special collection librarians Ruth Collingwood and Monica-Carmela Sajeva, and LCC Academic staff. 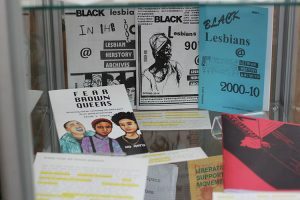 Content from the zine was displayed alongside items from LCC library special collections. Items were chosen in order to explore the ways in which representation of certain dominant voices is higher in our collections and the ways in which this can be challenged through critical librarianship. The library’s Printing Historical Collection charts the history and art of the Western book 15th to 21st centuries, and so is historical and can be problematic in that representation of certain voices is higher in printing history and mainstream published works; namely, the voice of the white, middle-class, European male. Ruth and Monica created Practice: Special Collections and Decolonisation, a document which explores the ways in which we can challenge this through collection development, provocations and other practice. 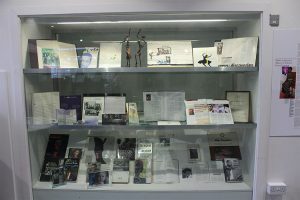 The library window hosted a series of displays curated by academic staff Karl Foster, Maureen Salmon and Mo-Ling Chui in which they explored their own identity through personal and library collections. Mo-Ling’s display will remain in the window until end of November 2018. The exhibition was supported by a series of Thursday evening events which included the Opening night, where talks by contributors to the zine and a tour of the exhibition by Ruth and Monica took place, as well as two panel events: Decolonising the Locale and Decolonising the Disciplines. The library ran a Zine as Decoloniser’ Critical Production Event aimed at providing Gurnham Singh’s ‘creative space to facilitate the production of culture informed by indigenous thinking and doing’ (1). It proved to be thought-provoking and empowering to many who attended though actual physical production proved to be elusive within the workshop’s 2 hour frame. Library staff created a Spotify playlist to accompany the exhibition, which visitors contributed to in person or via social media. More information about the zine, exhibition and events can be found on the Decolonising the Arts Curriculum blog. Singh, G. (2018) ‘What is decolonisation really about?’ in Decolonising the Arts Curriculum: Perspectives on Higher Education, pp. 1.